Sarah's Stamp Lab: Hello, Autumn! It's officially Autumn! There is just something about this season that warms my heart. I love snuggly sweaters, riding boots, and the warm, earthy colors of the season. Those elements of fall style that I love transfer over into my card making. I am in love with the new Petals & Paisleys Specialty Designer Series Paper. The warm rich colors of Rich Razzleberry and Delightful Dijon play off of the cooler tones in the Mint Macaron papers. It's just so, so gorgeous - you have to see it for yourself. 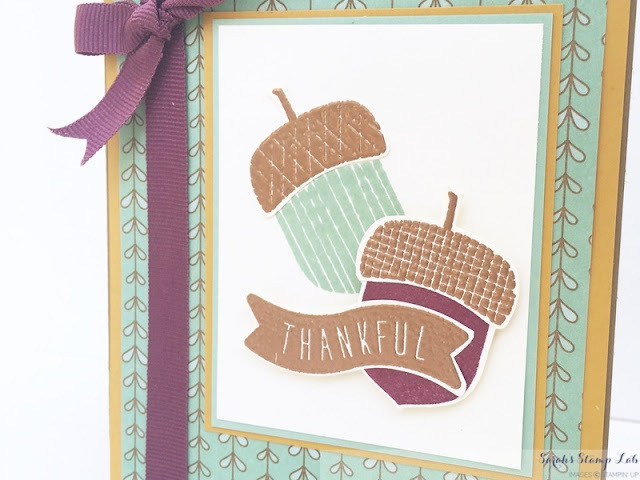 The Acorny Thank You stamp set coordinates with the Acorn Builder punch for easy stamping. No fussy cutting for us! Well, I lied. I did fussy cut the Thankful banner. That's an easy one for fussy cutting though! I layered all of the elements on top of each other with dimensionals to really give a more three dimensional look to the card. Thanks for looking at my card today! I would love to hear your feedback in the comments section. Please contact me if you have any questions about how to make this card! Soft Suede: 5-1/2" x 8-1/2"
Delightful Dijon: 5-3/8" x 4-1/8", 3-3/8" x 2-3/4"
Mint Macaron: 3-1/4" x 2-5/8"
Petals & Paisleys DSP: 5-1/8" x 3-7/8"